​​​​AUSTIN – As Austin continues to grow, so do concerns surrounding affordability, but what factors go into making a city affordable? Median incomes for the different areas vary, contributing to the wide-ranging amount of discretionary income; however, when applying citywide median incomes across the three regions, Central Austin proves to be the most expensive area of the city. Affordability has been a stated 2017 focus for Austin City Council, though council members agree the subject is too vast to talk about generally. 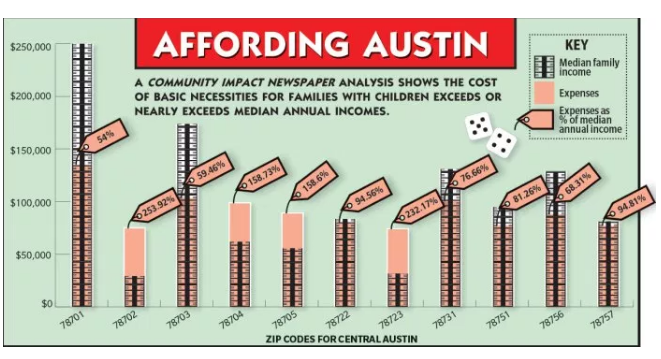 District Six Council Member Jimmy Flannigan, whose district spans Northwest Austin, said one of the biggest challenges for the city in measuring affordability is the amount of economic disparity, not only across the city but also within council districts. Housing and transportation in Northwest Austin, he said, are the largest contributors to budget stress. While much of the housing conversation has been focused on providing diversity in housing types across the city, Flannigan said more public transportation options are needed as well.